View More In Galvanic & High Frequency Machines. An effective tool for toning, invigorating and soothing the skin while stimulating blood circulation on scalp and skin.The Yameili CME-9112 model System comes equipped with:4 electrodes* Large onion shape electrode for large facial areas. * Small onion shape electrode for small facial areas. * Spoon shape electrode for spot areas. * Small Bulb shape electrode* Requires 110V U.S. household currentNote:*** NO Rake electrode available for this unit ****The rake is for the scalp. 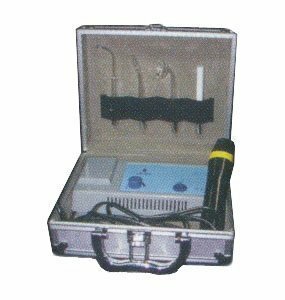 It only comes with CME-A116 which is the HF machine designed for the scalp.This High Frequency unit CME-9112 is not for the scalp. It comes with the regular electrodes, spoon, mushroom, etc specific for the skin. The two machines operate on different frequencies, therefore, you cannot use a rake electrode in this unit. If you have any questions about this product by B & S Beauty Supply, contact us by completing and submitting the form below. If you are looking for a specif part number, please include it with your message. Clarisonic Mia 1, Sonic Facial Cleansing Brush System, Electric Pink + L'Oreal Paris Pure Clay Mask Detox & Brighten, 1.7 fl. oz.